How is it that each year the holidays seem so far away, and then WHAM it’s in two weeks’ time, you’ve got no gifts and your card is never going to make it to Auntie Jane in Australia in time. Well, don’t panic on the gift front. 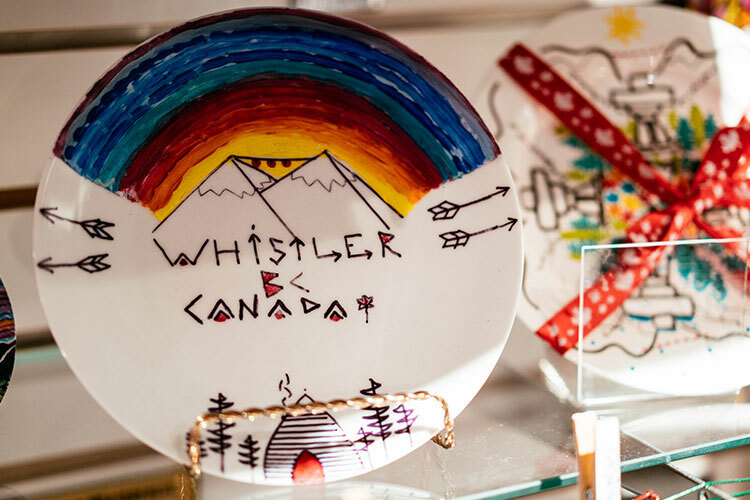 Whistler has a great retail scene, and if you dig a little deeper into some of the stores, you’ll find some unique items designed and/or made right here in the mountains. 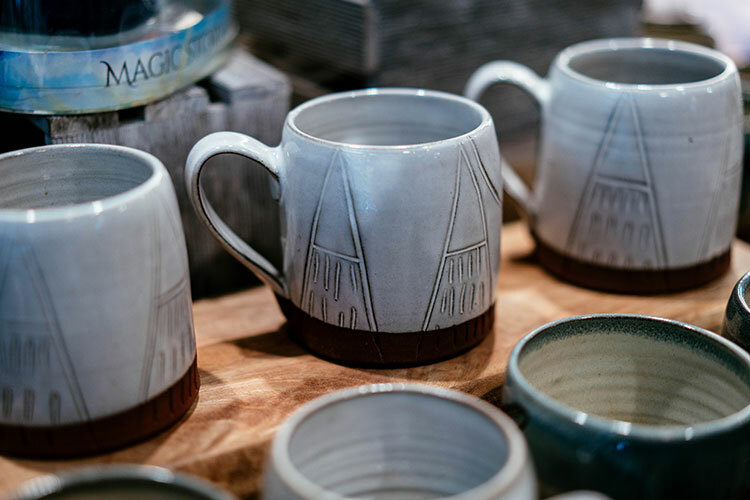 From hand-glazed pottery to printed cushions, reclaimed wooden art pieces to fragrant candles, balsamic vinegar to earrings made of bike tires – Whistler’s creators, artisans, and shop owners have got you covered. This isn’t just a list for use at Christmas time – if you’re looking for a gift to take home or a memento from the mountains, this is your guide. 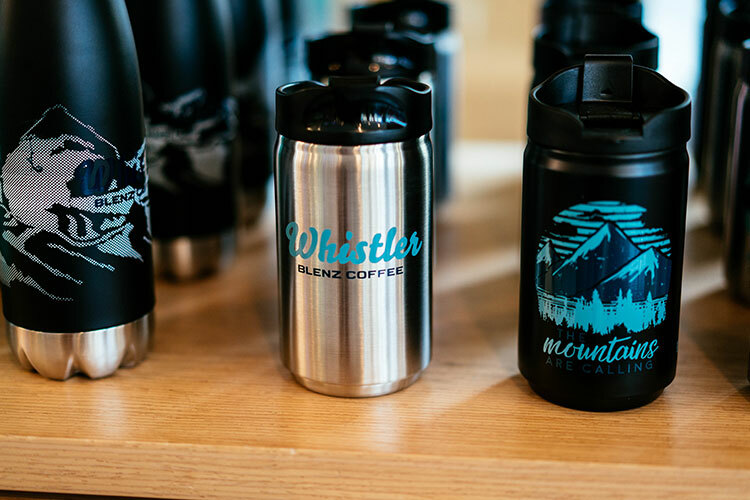 Let’s take a look at where you should head to hunt down these made-in-Whistler gifts. At the entrance of Portobello Market and Fresh Bakery is an array of gifting goodies. 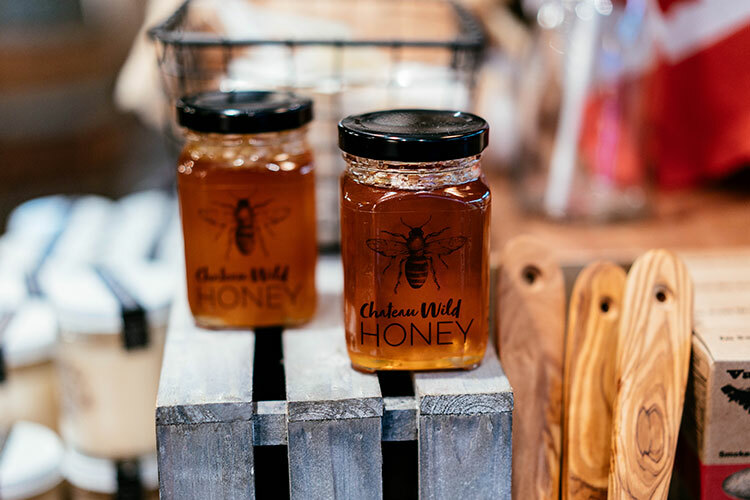 Their Chateau Wild Honey is made from bees that reside in their rooftop gardens and is a yummy stocking-stuffer idea. There’s Canadian sea salt from Vancouver Island, and scenic coasters and mugs made on Salt Spring Island – I realize these aren’t purely made-in-Whistler options, but they’re not from too far afield! I dare you to get in and out of this place without getting tempted by the smell of freshly baked donuts or a roast porchetta sandwich. 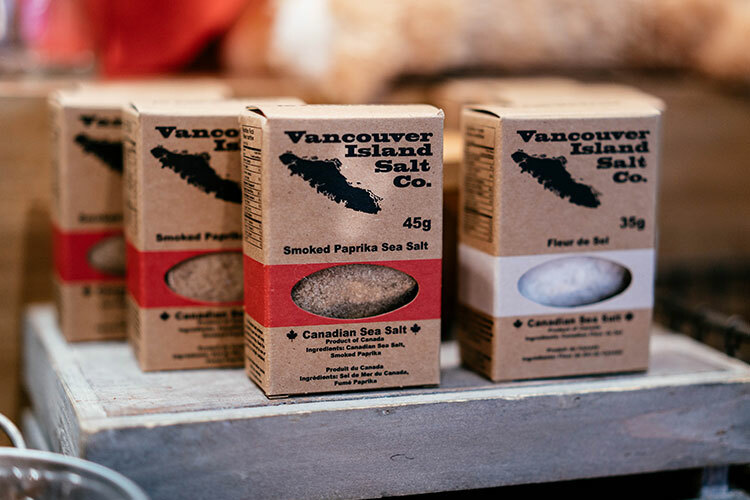 Product: Vancouver Island Salt Co. 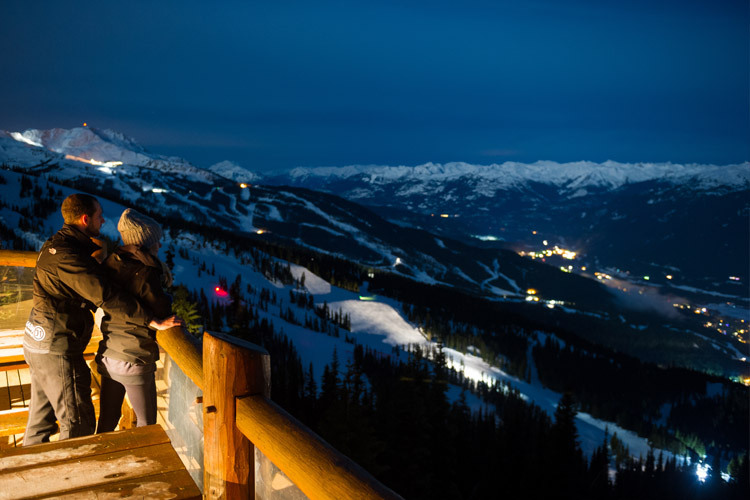 Located in the Upper Village, opposite the main entrance of the Fairmont Chateau Whistler, is the Blackcomb Liquor Store. 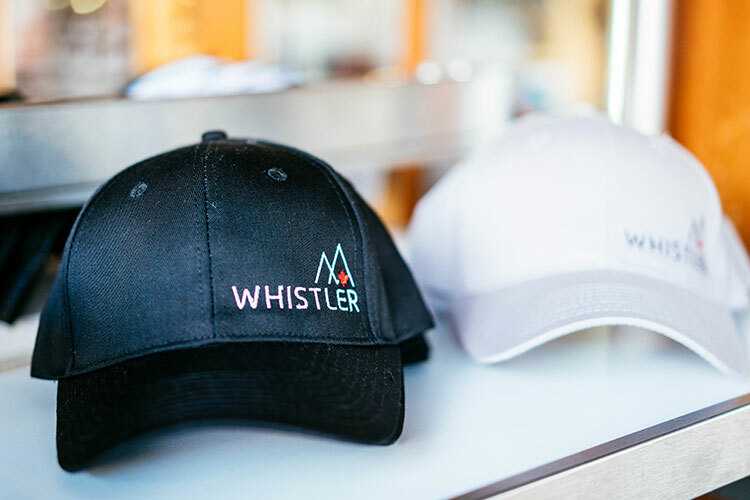 Not only will you find some of the most knowledgeable liquor lovers in Whistler inside, but also a whole section of goodies dedicated to showcasing yummy products from all over British Columbia. 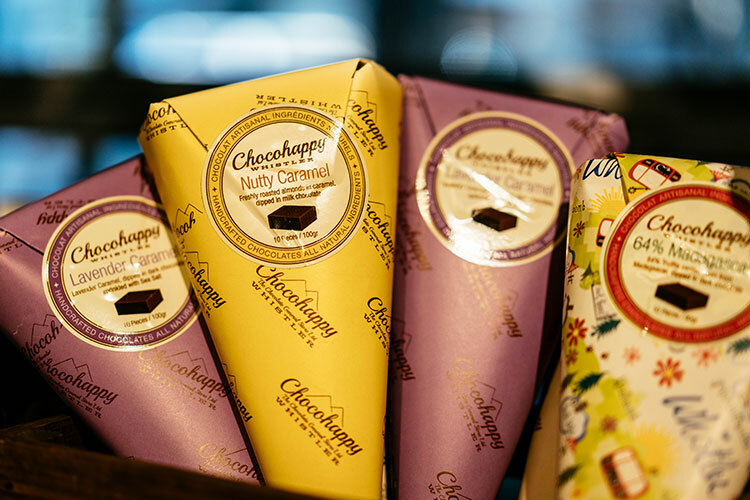 Curated by the Edible Canada team, this section features beautifully packaged chocolate bars with local artwork on the front, and then there’s my favourite Whistler aprés-dinner treat – a lavender caramel Chocohappy cone. 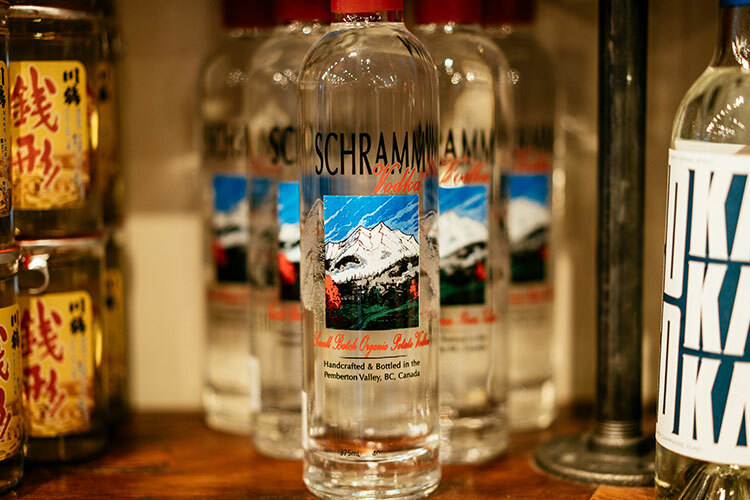 For those looking for a boozier Whistler-based gift check out Coast Mountain Brewery beers and Schramm vodka and gin – made from organic Pemberton potatoes. 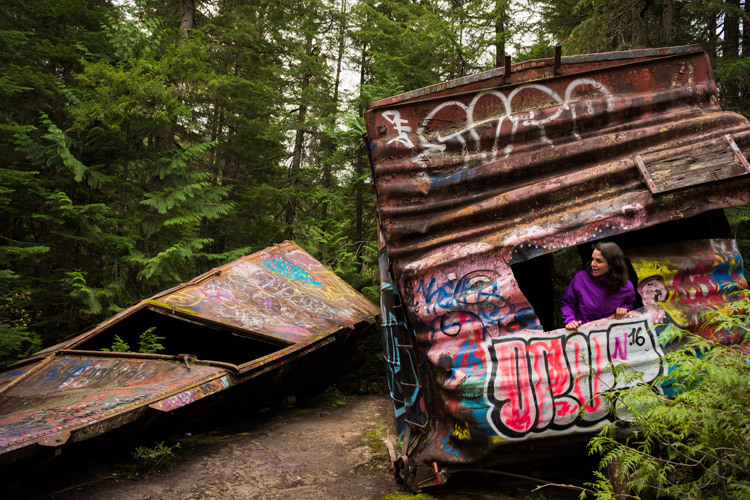 The Squamish Lil’wat Cultural Centre is another gift treasure trove. 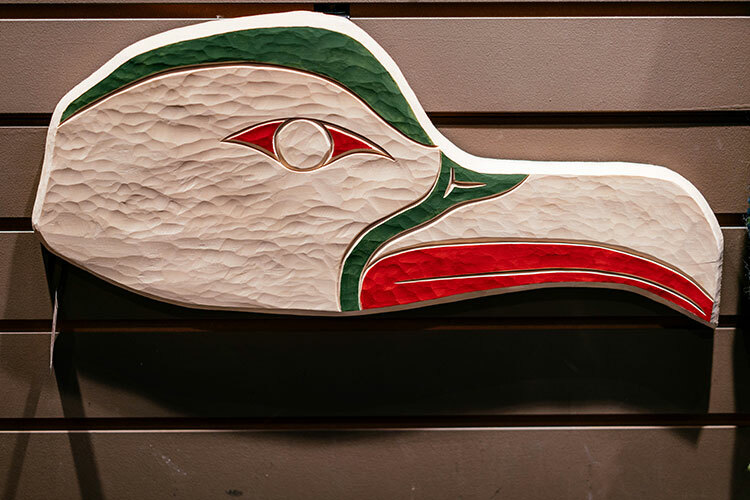 The walls of the gift shop are covered with First Nation carvings, and among them is the work of Redmond Andrews, one of the guides at the centre. His two current pieces depict the bald eagle, a bird that can be seen perched in the trees along the Sea to Sky November through February. 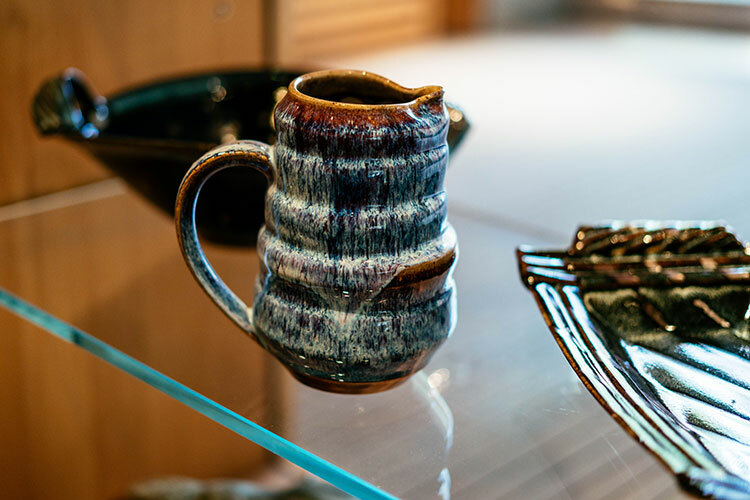 From wood to clay, the pottery work of Stewart Jacobs is also featured at the shop, each one with a signed inscription on the bottom. 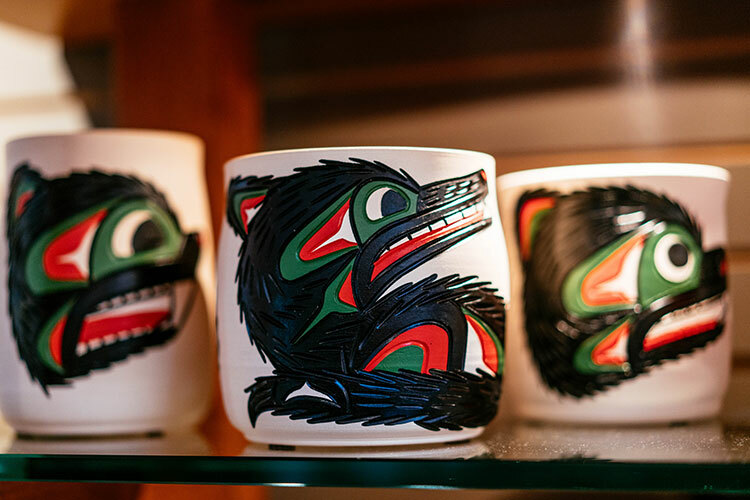 The glassware of Haida artist, Michael Forbes can also be found here, along with weaving work by Janet Jacobs and Travis Bills, and beautifully painted drums by Lil’wat artist Ron Wallace. Nestled inside the impressive lobby of the Audian Art Museum is their gift shop. You don’t need to purchase museum entry to go to the shop, but it’s such an incredible experience that it would be a shame not to. Look out for the pink “We Heart Local Art” stickers that denote the local artists that are represented. One of these is potter, Vincent Massey. He has a home studio in Whistler that is open to the general public in the Alpine Meadows neighbourhood, but the Audain has a lovely collection of his work for sale. You can’t help but reach out to touch the ceramic artwork of Kathleen Tennock. She works the clay using a method called Naked Raku, which uses smoke firing to create the markings, giving her pieces a beautiful stone-like quality. 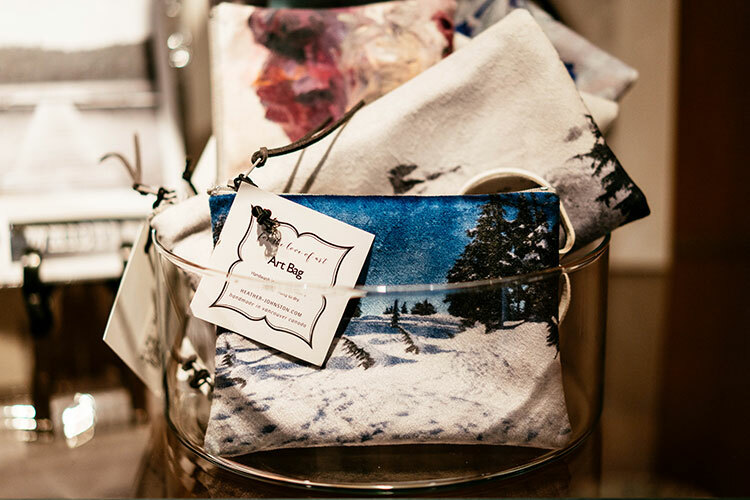 For some stocking, suitcase, or postage options take a look at Heather Johnston’s coasters, prints, cushions, and hanging ornaments all featuring her photography of Whistler. 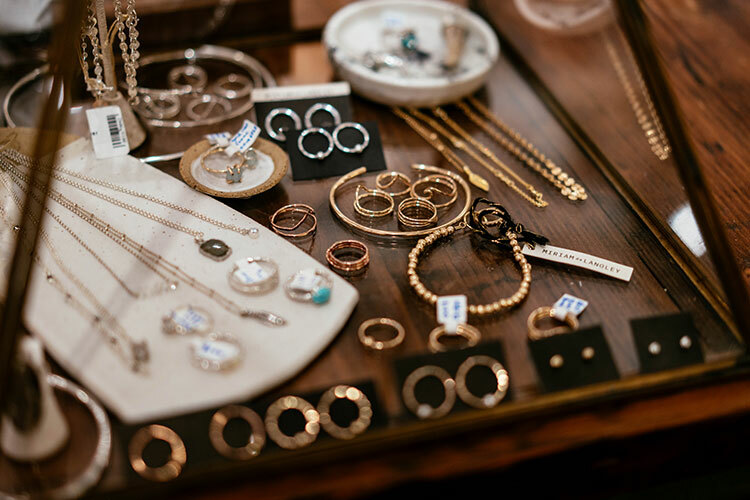 3 Singing Birds is a beautifully curated store, and a lot of their products are locally sourced. 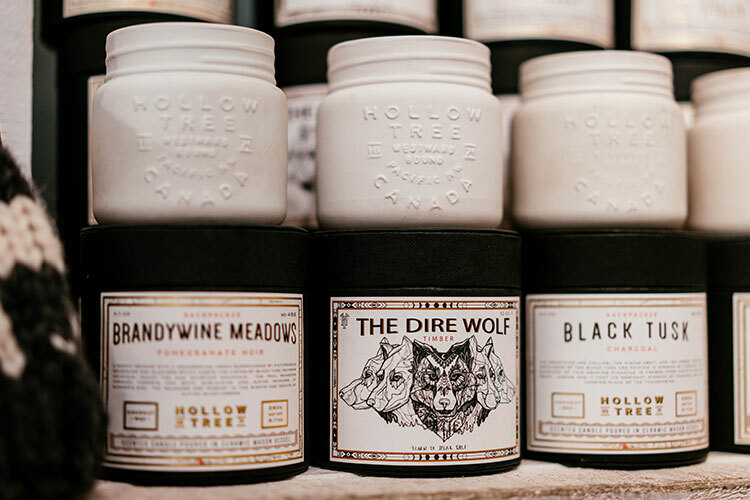 You might smell them before you see them – Hollow Tree candles are handcrafted from coconut wax in small batches in Whistler, and the scents are inspired by our alpine meadows, forest groves, and verdant valleys. 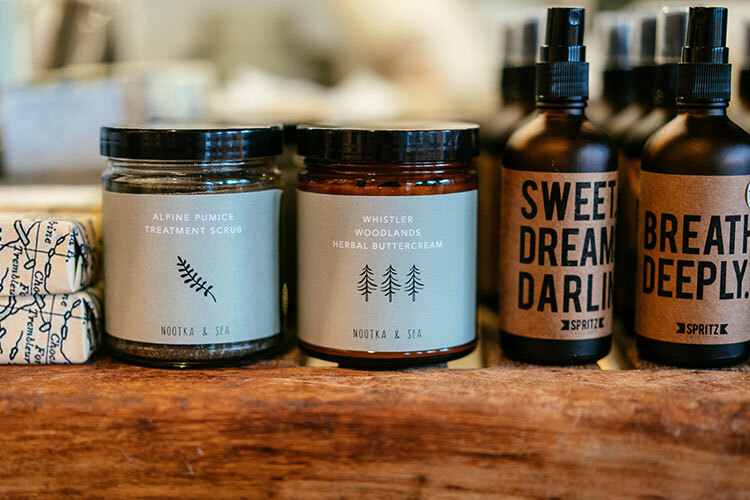 Another scent-based option is the Squamish-based company Nootka & Sea, whose body care products offer ‘natural healing for the wild adventurer’ and come in lovely packaging. 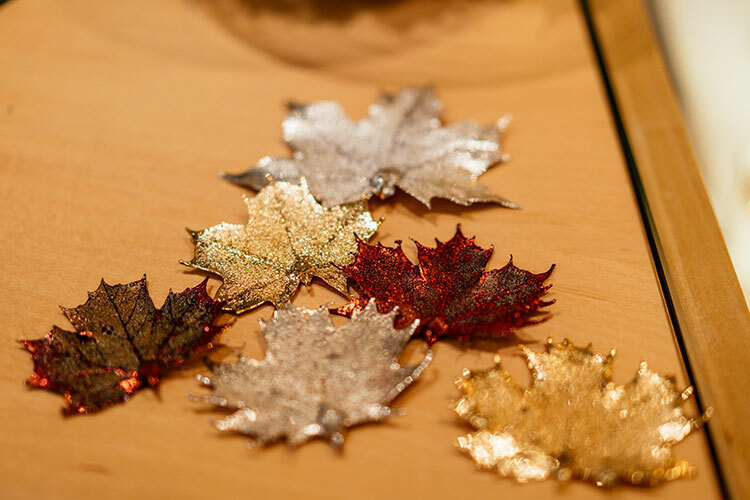 Take a look at the work of local gold and silversmith Miriam de Langley, whose work blends the rough and refined to make laid-back, one-of-a-kind pieces that are inspired by Canadian wildlife as well as the beauty and imperfections of nature. 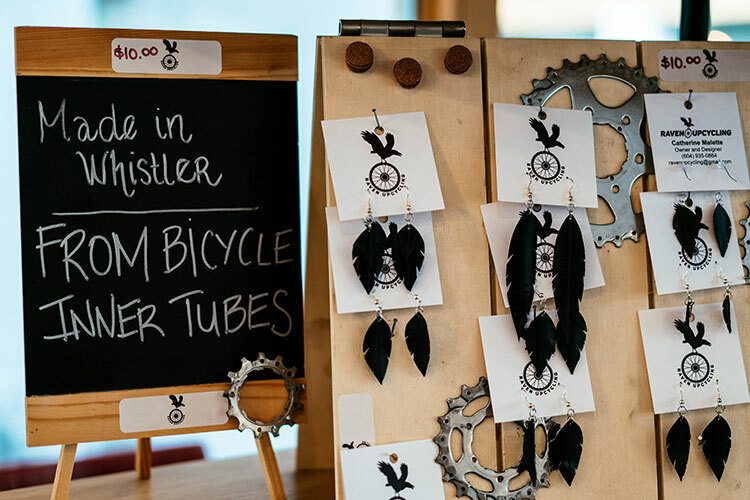 Our locally-owned and operated Blenz Coffee has always been a supporter of local artists including some incredible feather earrings made from bicycle inner tubes by Raven Upcycling. They also have the artwork of Ali Cat Arts who developed the loveable “Creekside Critters,” which are a hit with kids and big kids alike. A dangerous place to step into unless you’re prepared to be tempted by rows upon rows of sweet treats! 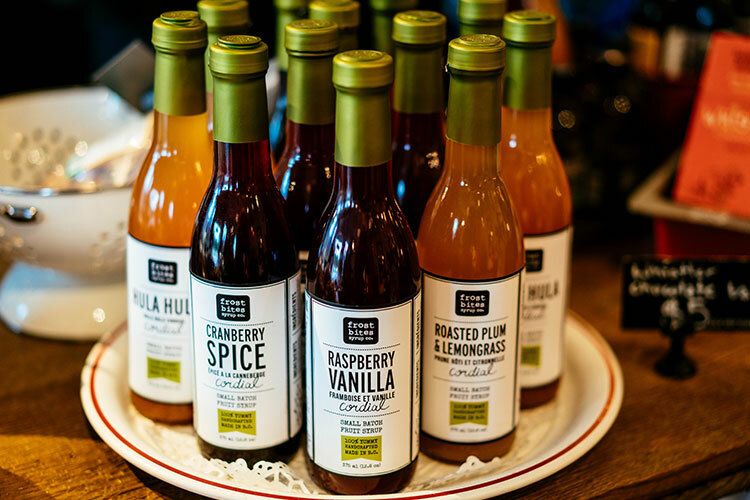 On their display units is a range of locally-made products perfect for foodies. 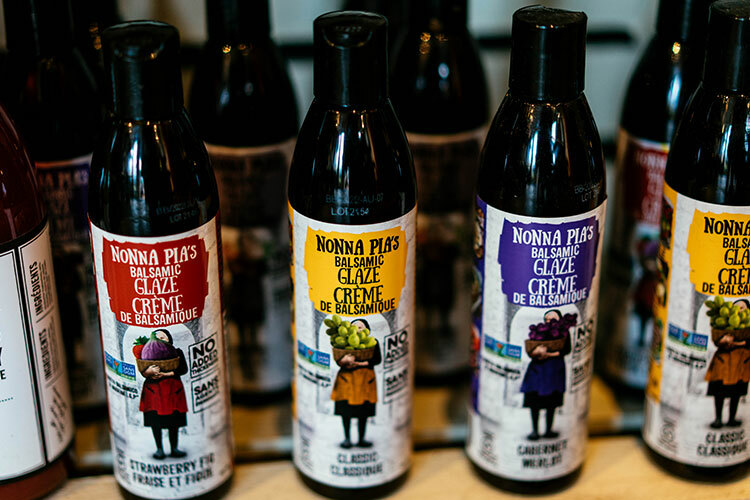 Nonna Pia’s Balsamic Glaze is made in Whistler, and adorns many Whistler locals’ dinner tables, adding a dash of Italian sophistication. 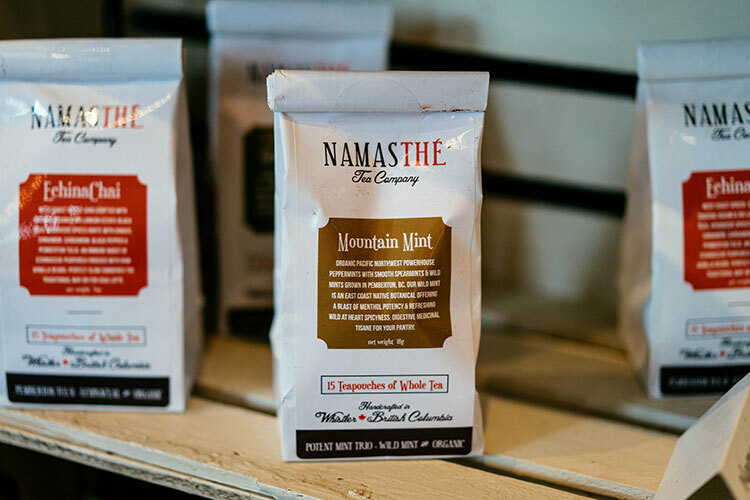 Then there’s Namasthé Tea Co. who hand blend premium loose leaf teas with their foraged botanicals and herbs grown organically by local farmers in Pemberton, and Frost Bites Syrup Co. who handcraft small batches of all natural fruit and botanical cordials, syrups and tonics in Squamish – yum! 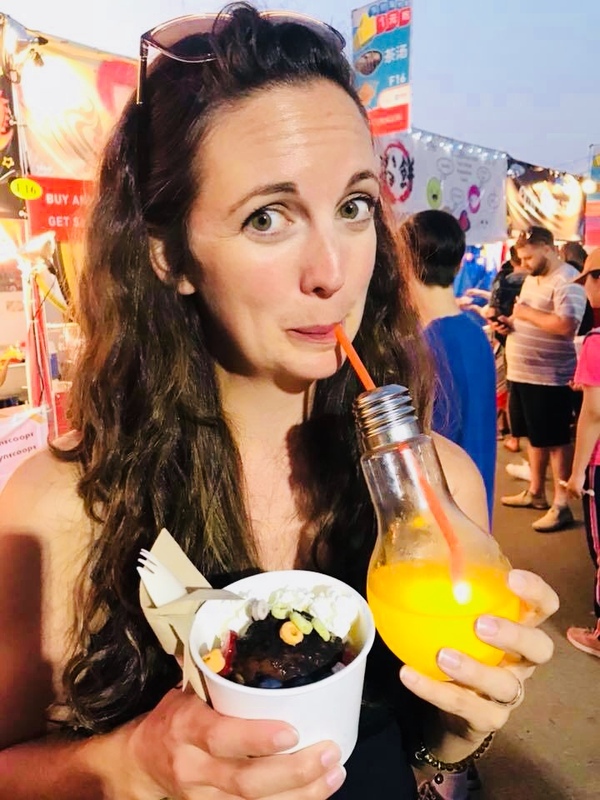 Product: Frost Bite Syrup Co. 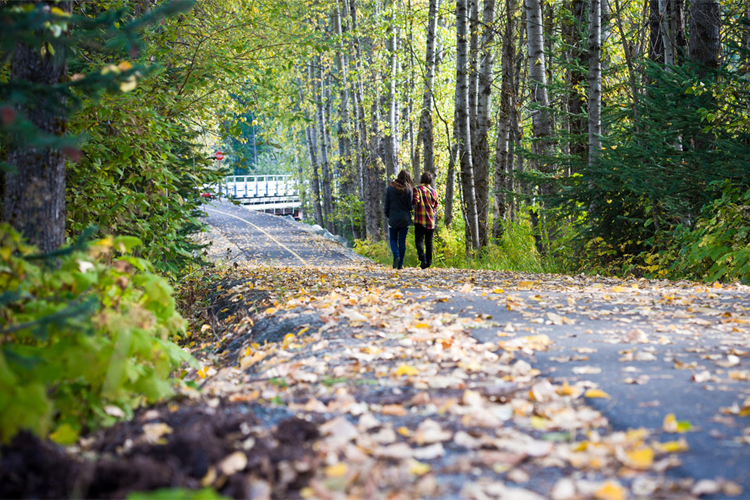 Inside the Maury Young Arts Centre you’ll find the hub for all things arts and culture in Whistler – this is the home of Arts Whistler. In their lobby area you’ll find a great gift shop featuring all local artists and artisans, and make sure you take a peek upstairs at their free gallery. 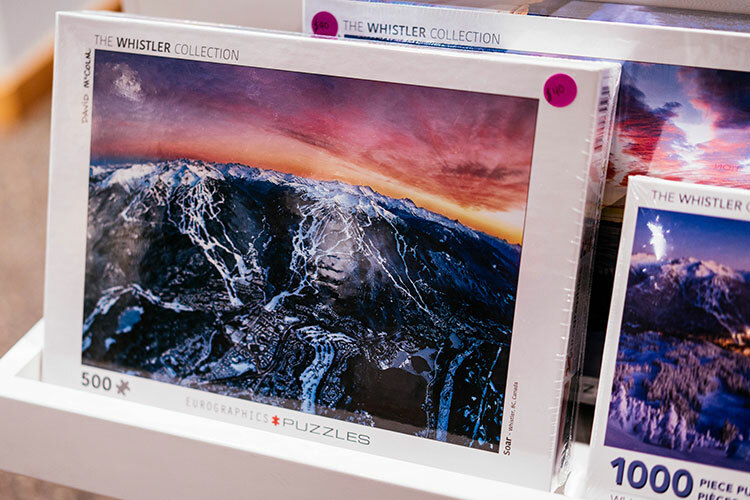 Stunning puzzles featuring the work of local photographer David McColm caught my eye, and I could just imagine doing that beside a roaring fire with the snow flying outside. 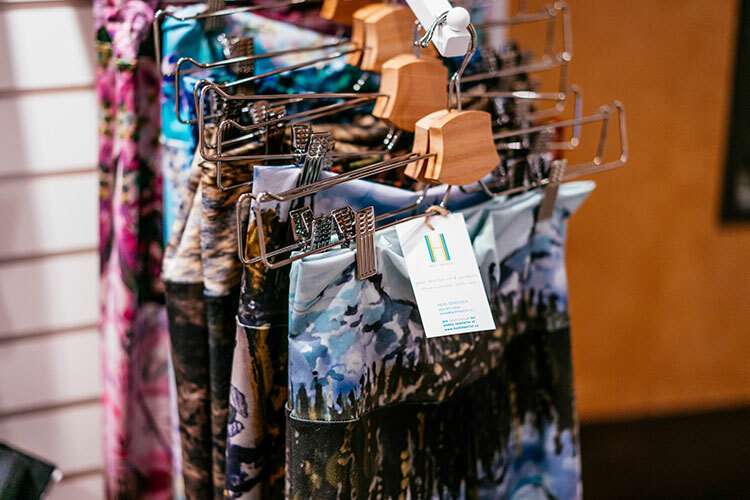 Heidi the Artist has wearable pieces of art, placing her stunning paintings on leggings, scarves, and hats using recycled materials and natural fibres such as bamboo, hemp, organic cotton, organic linen, and silk. 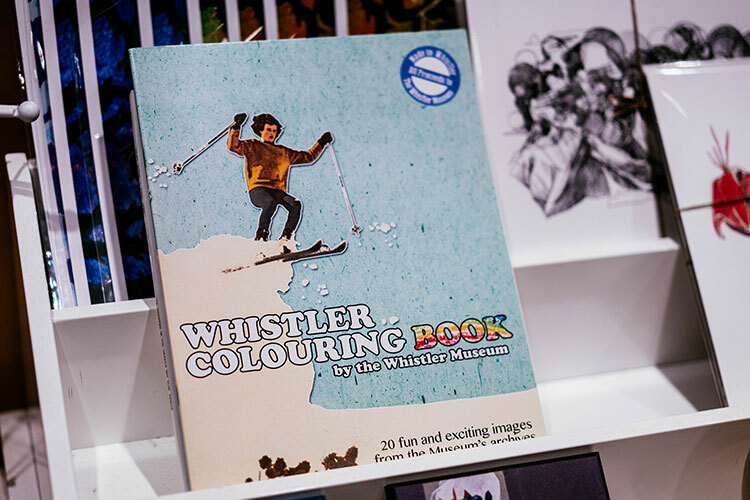 For the kids, there are colouring books featuring images from the Whistler Museum archives, as well as “Mountain Monster” stuffies, and comfy pillows that would look fantastic on a toddler bed (or your king-sized one for that matter). Each glass case in Ruby Tuesday is filled with something glittery, soft, sparkly, or, in the case of Justine Brooks, intriguing. 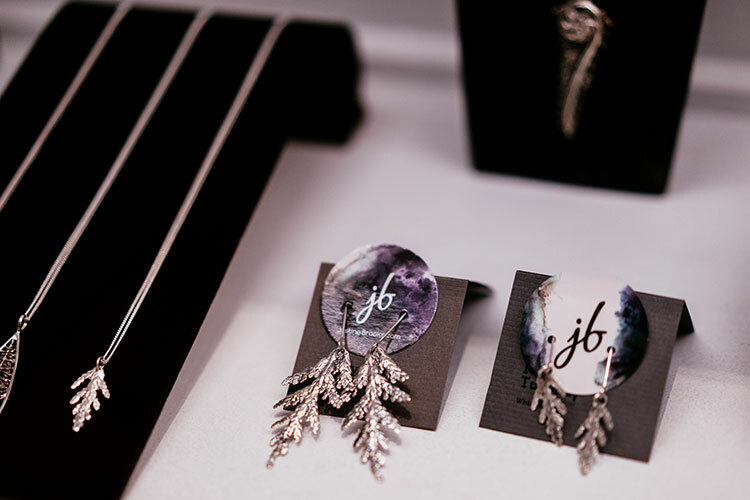 This Squamish-based jeweller uses a technique called “lost wax casting” where she moulds some of her pieces around the real deal – it’s what makes the bees, pine cones, and cedar branches so life-like. 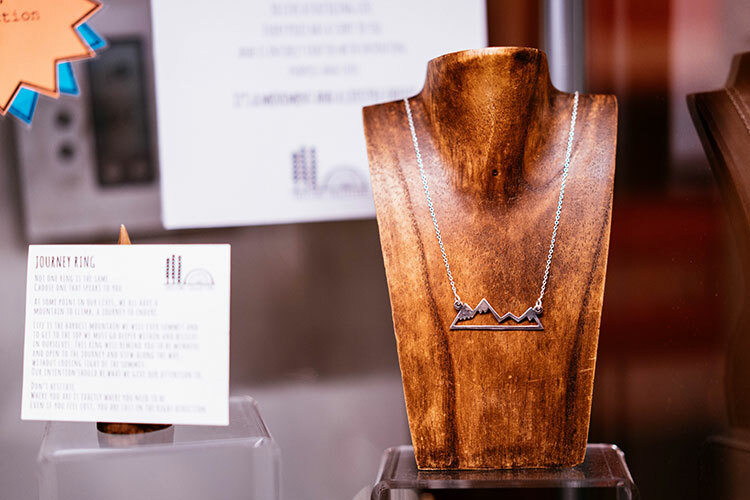 Treeline Collective’s mountain range pendants are a perfect way to remember your time in Whistler, and you can feel good sporting anything from the Pemberton-based mana line, which is made from recycled and reclaimed wood. 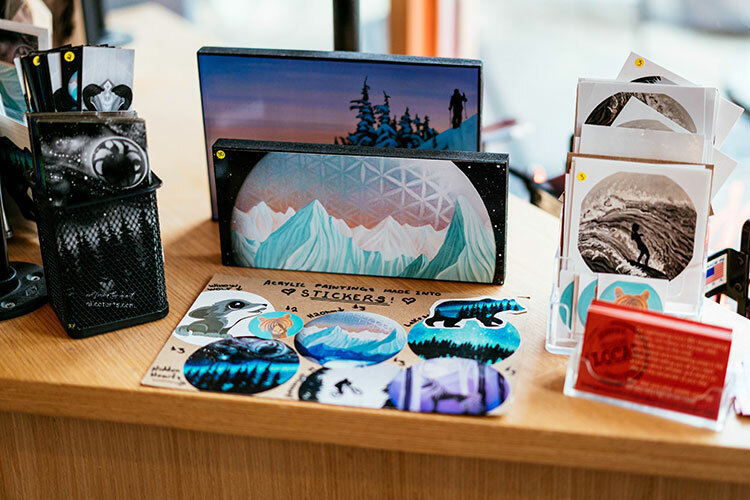 To the right-hand side of their counter, Nook of the North has a section featuring hand-painted festive decorations, coasters, plates, and funny sewn creatures from local artisans that are perfect for a small token or souvenir. 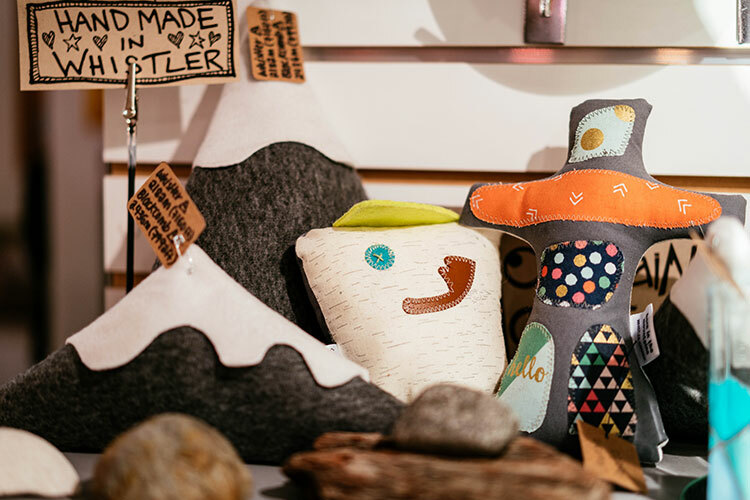 Nook of the North work with a host of local artists including; Bronwen Granger, Amy Morrison, Glenn Rodgers, Gemma Kellet, and Ginette Guiver – Ginette actually won the recent Prior Snowboard Topsheet Design Competition this year. 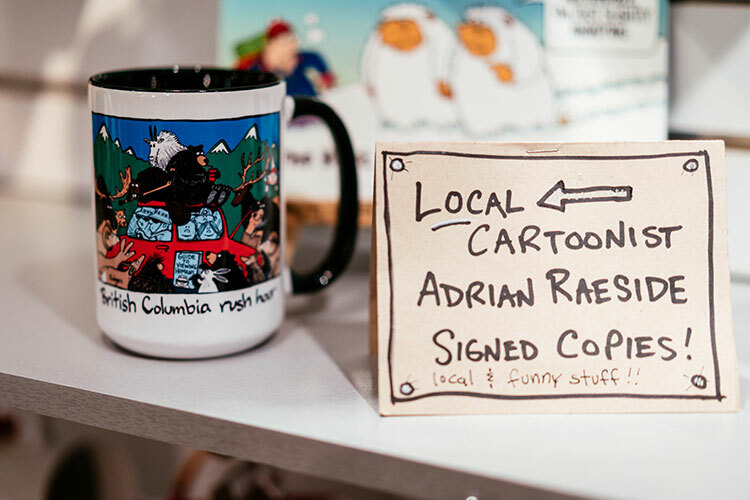 They also feature local cartoonist Adrian Raeside, whose dogs and wild animal stories have graced over 400 newspapers and magazines around the world. 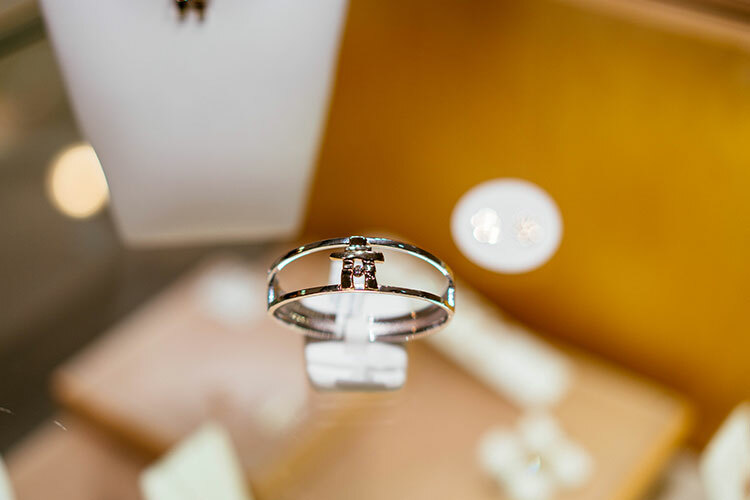 This locally-owned jewellery store invites you in to take a look at their sparkling cabinets filled with precious gems and Canadian diamonds. 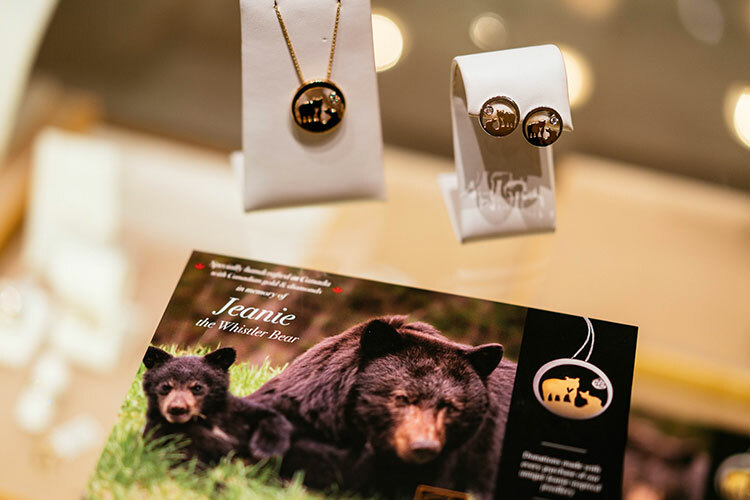 The Jeanie Jewellery Collection commemorates a black bear who lived in Whistler, becoming the star of many tours for over 20 years. 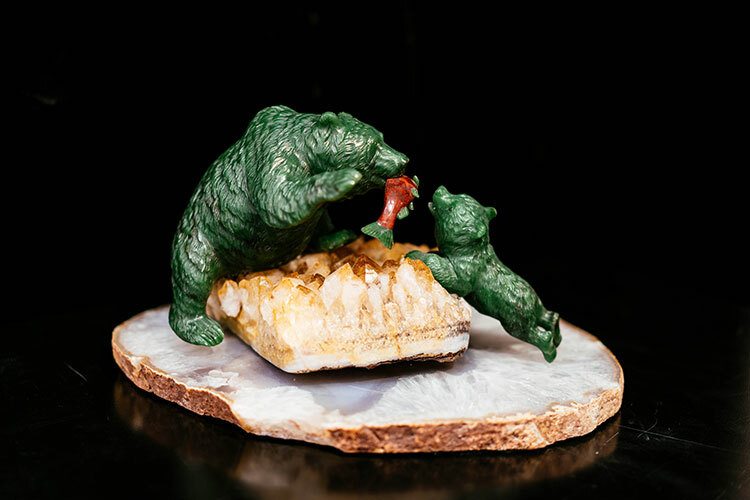 For each piece sold in this range, Keir donates a portion of the sale to Whistler’s Get Bear Smart Society, who help to educate the public about the bears who call this land home. 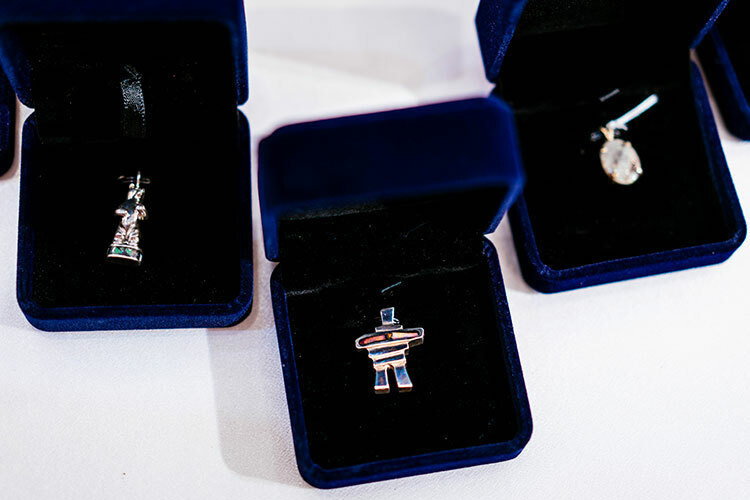 A symbol used by the Inuit people of Canada’s Arctic region, the Inukshuk can be seen all over Whistler and is featured on necklaces and rings with the addition of one of those glittering Canadian diamonds – the perfect keepsake or dare we say, engagement ring? 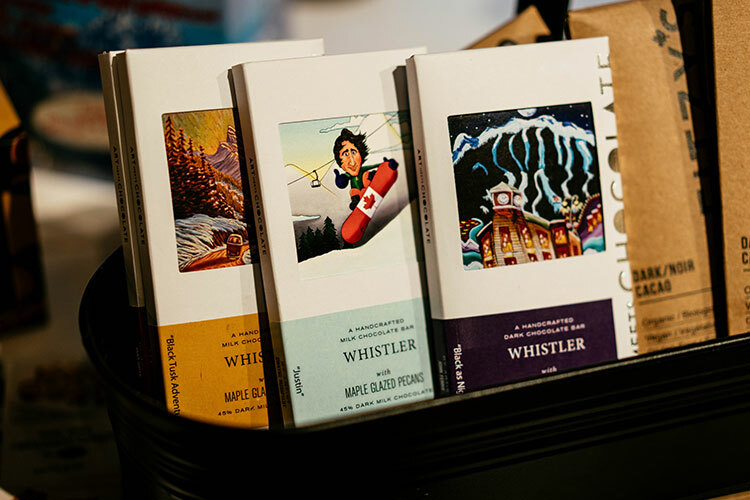 We have some incredible authors who call Whistler home, and it’s no wonder given the inspirational place they have to hone their craft. 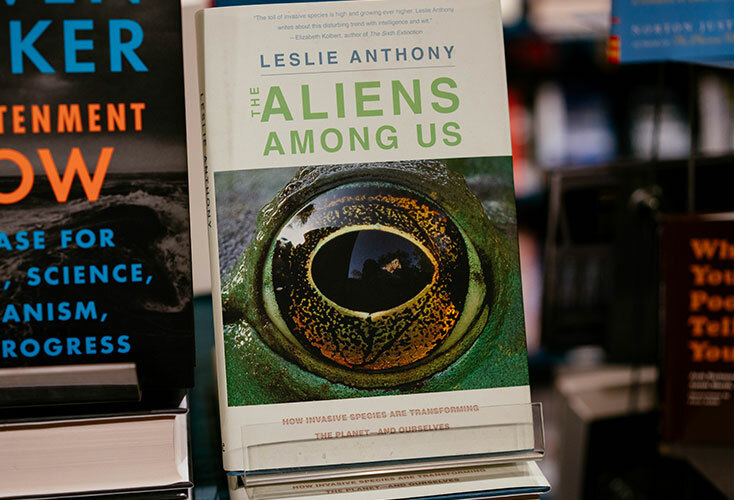 Leslie Anthony’s byline can be found in Whistler’s Pique NewsMagazine as well as multiple adventure and ski publications and on the shelves at Armchair Books. 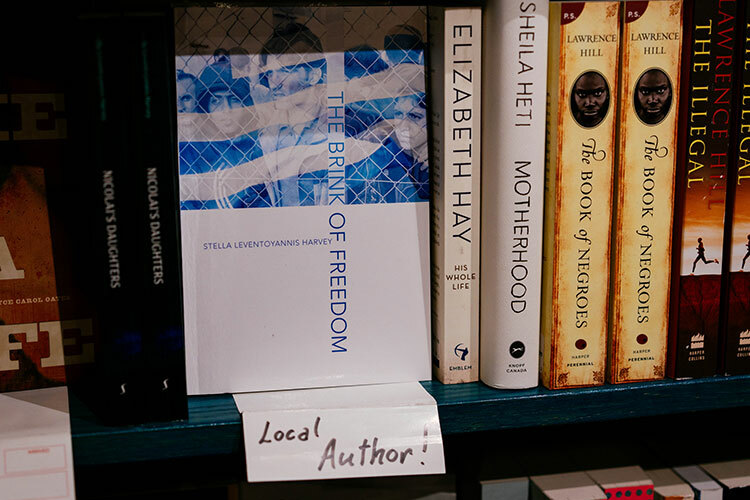 From fact to fiction, Stella Harvey, the founder of the Whistler Writers Festival, is also the author of two books which have a connection to her Greek-family past. 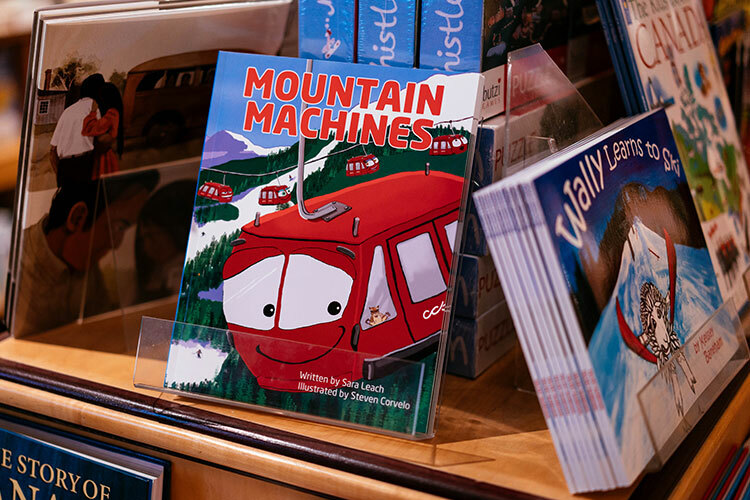 For younger readers, local author Sara Leach is a great option, and her Mountain Machines book has a definite tie to Whistler! This is also a good place to get cards including a whole selection of Whistler ones. 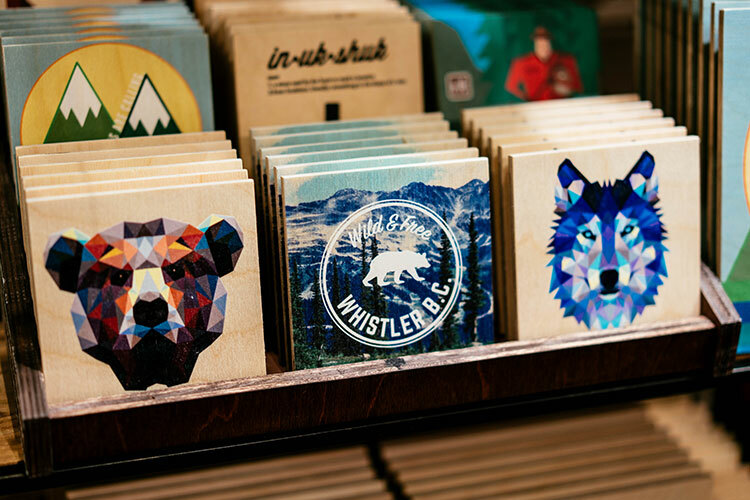 Using sustainable wood from local mills, Reclaimed Print Co. has a colourful collection of coasters, hanging ornaments, and wall decorations that feature iconic Canadian creatures and characters, as well as some Whistler-specific options. We’re huge fans of the lumberjack! 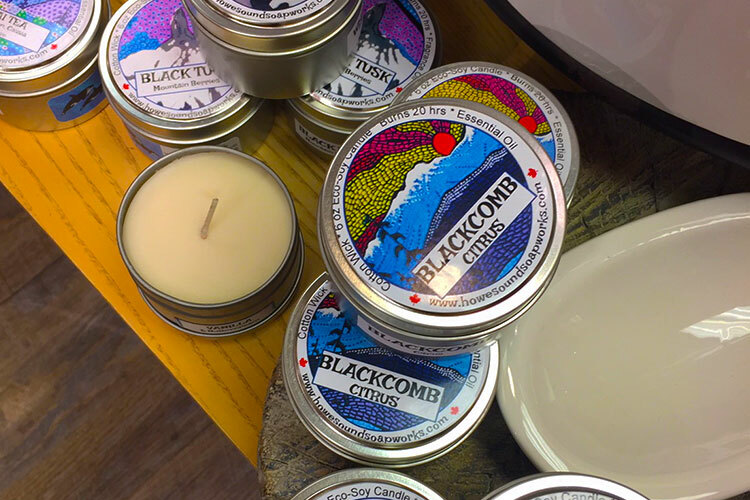 They also have the candles and soaps of Squamish-based Howe Sound Soapworks – they might fit perfectly in the heel of a large stocking? 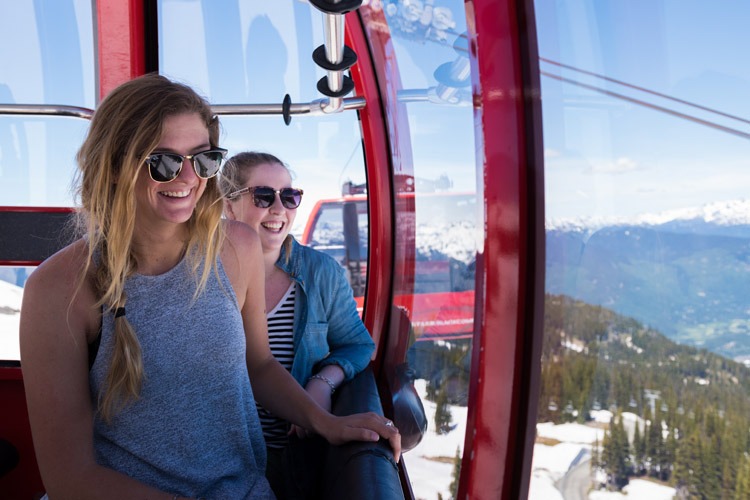 People typically spend in excess of $100 on their ski goggles, and then they get thrown in the back of the truck, squished next to you at aprés, and precariously stacked on top of your skis in the garage – in short, they can easily get scratched. 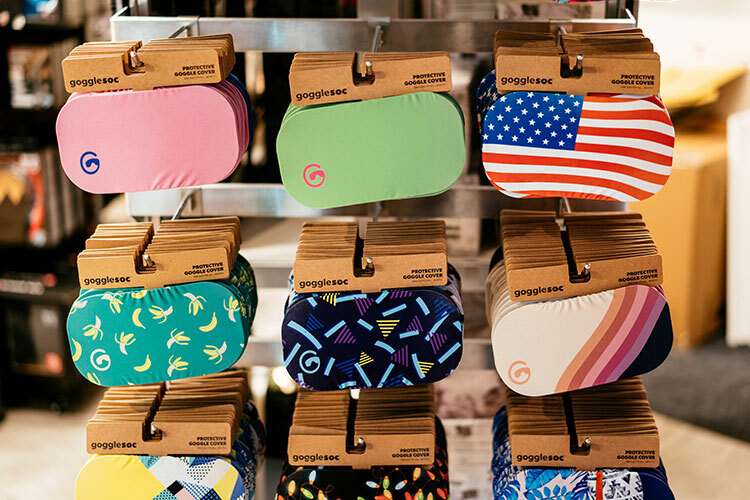 That’s what Whistler-based company gogglesoc realized, putting fun and bright graphics on protective covers that not only solve this issue, but also look pretty dope. 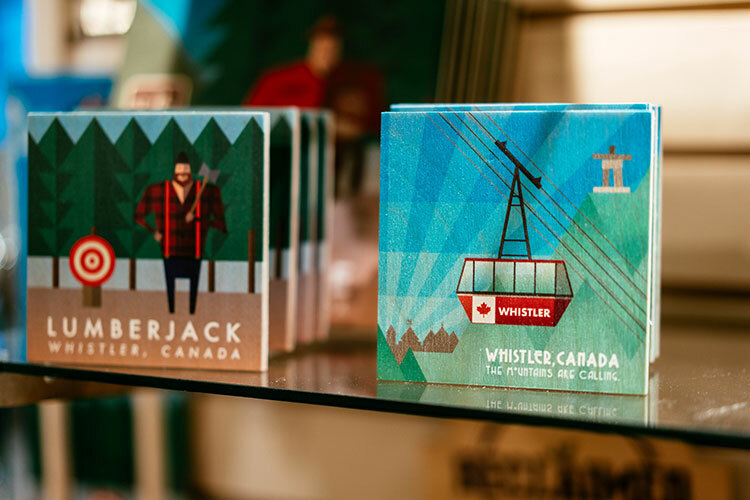 They even have a Whistler specific one – a great idea for an Xmas stocking. 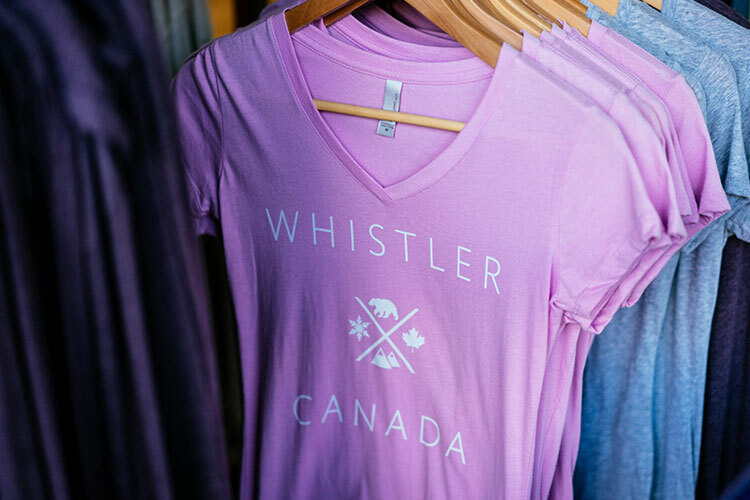 Note that McCoo’s also has a selection of Whistler t-shirts, hoodies, and hats to bulk-out your gift-giving options. 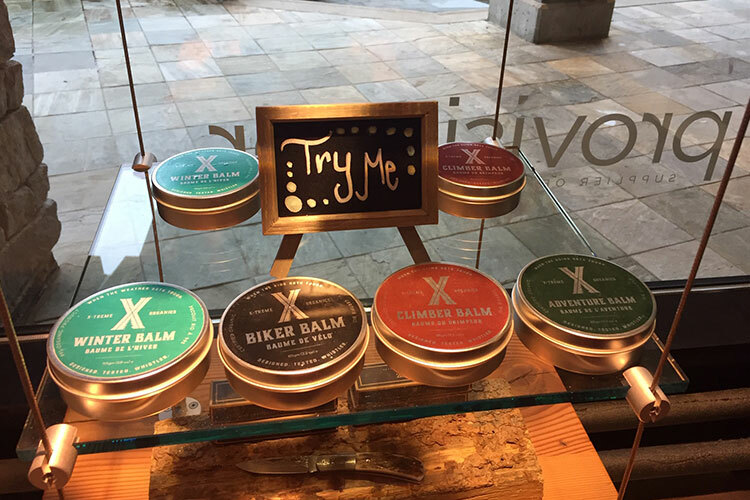 This store has a funky selection of hipster t-shirts, pen knives, beanies, and other mountain knick-knacks but it’s the X-treme Organics adventure balm that we think makes a good gift. 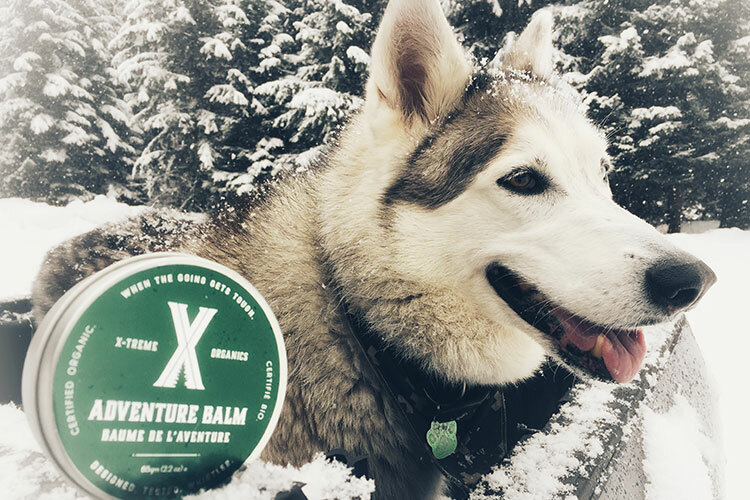 Designed for people spending time in the great outdoors, the balms offer protection to skin that’s exposed to the elements. 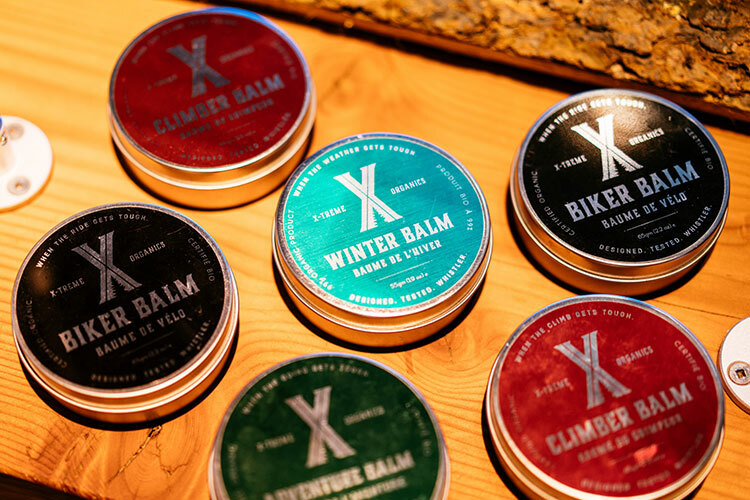 The perfect gift for the adventurer in your life who might need a little TLC. 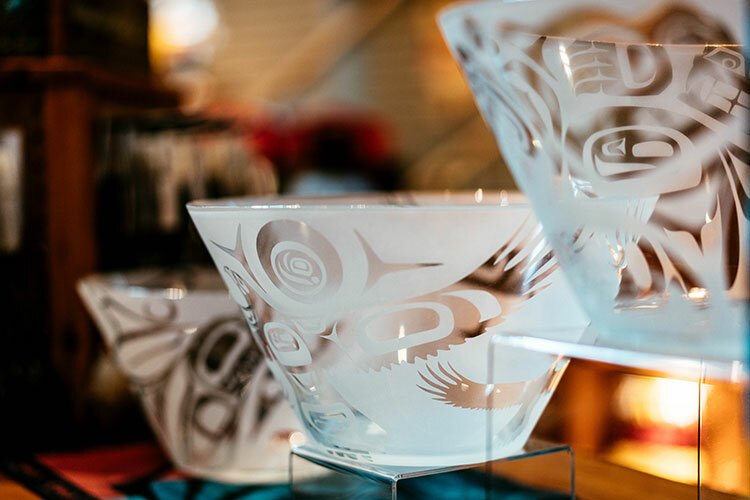 Inside the Westin Resort & Spa you’ll find a selection of stores including Fathom Stone Art. 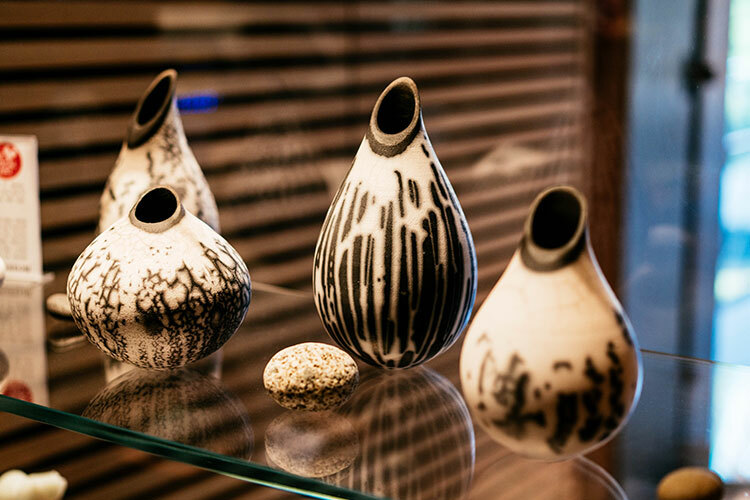 Here, you can either pick up a stunning piece of artwork or jewellery by a local artist, carved in locally-sourced stone, or you can make one yourself. 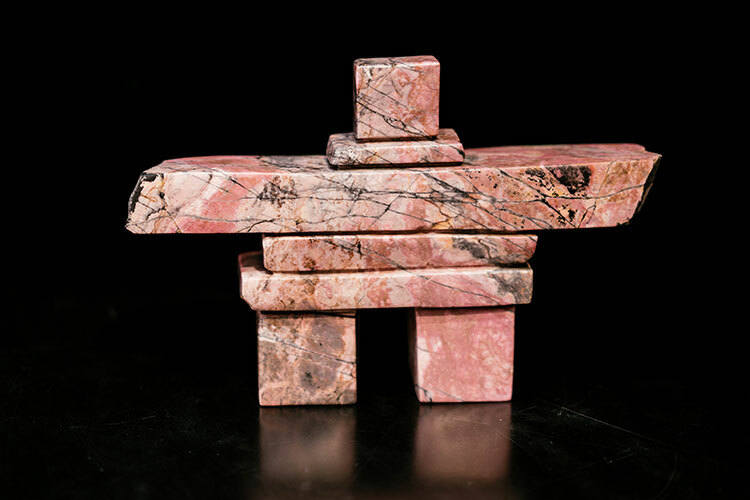 They have workshops for would-be sculptors and jewellery makers so you can come away with your own BC opal pendant or soapstone Inukshuk, wolf, or bear. Another great gift idea with a handmade touch. 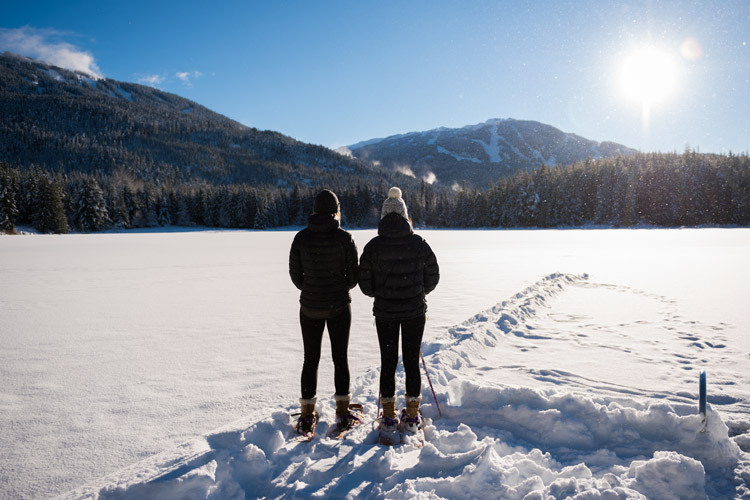 If you happen to be in Whistler in late November be sure to head to the Arts Whistler Holiday Market, happening on the 24th and 25th at the Whistler Conference Centre. 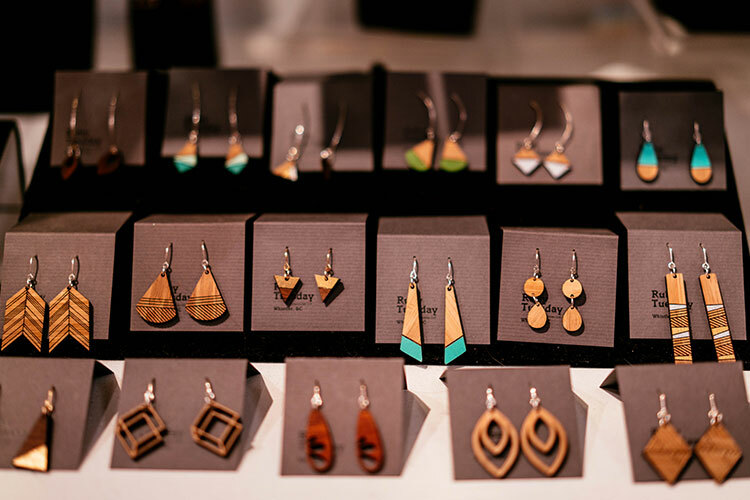 Over 100 vendors from the Sea to Sky will be there including a lot of the artists and artisans mentioned above. 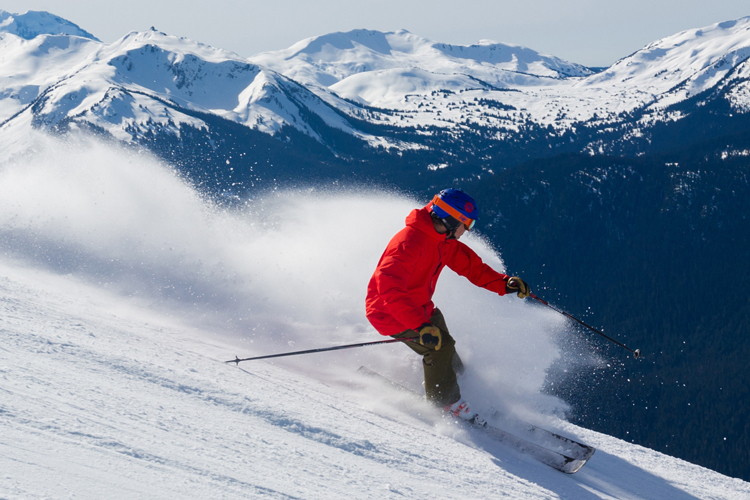 For more retail options visit Whistler.com’s shopping page – happy shopping!